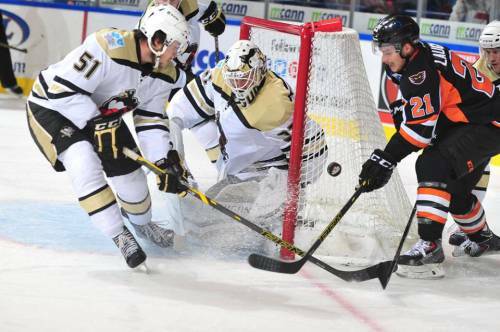 A power play goal nearly five minutes into overtime put an end to the winning ways of the Berlin Wall as the suddenly ineffective Lehigh Valley Phantoms fell 2-1 at the hands of the intra-state rival Scranton/Wilkes-Barre Penguins as the American Hockey League‘s all-Pennsylvania competition continues. Scranton/Wilkes-Barre rookie netminder Matt Murray, the lanky 20-year-old (6’5″ 172 lbs) from Thunder Bay, Ontario, who was the third round pick (# 83 overall) of the Pittsburgh Penguins at the 2012 National Hockey League Draft, had a phenomenal evening in turning aside 42 of 43 shots faced. Fellow Penguins rookie Jean-Sebastien Dea, the undrafted 20-year-old center from Laval, Quebec, scored the game-winner and added an assist against the Phantoms, as well, to assume Scranton/Wilkes-Barre leadership with seven points so far this season (7 ga, 3 go). Lehigh Valley, clearly missing the influences of the two American defensemen, Shayne Gostisbehere (recalled by the Philadelphia Flyers) and Mark Alt (injured), went a woeful 0 for 9 on the power play and failed to convert two lengthy 5-on-3 opportunities, one each in the second and third periods, respectively. The punchless Phantoms also did not take advantage of the fact that, during the course of the contest, the visiting Penguins lost two of their six defensemen on account of injuries. Roughhouser Reid McNeill, the sixth round selection (# 170 overall) of the Pittsburgh Penguins at the 2010 NHL Draft who had 119 penalty minutes in 55 games for Scranton/Wilkes-Barre last season, went to the locker room towards the end of the second period while Derrick Pouliot, the highly touted 20-year-old rookie who was the Penguins’ first round (# 8 overall) choice at the 2012 NHL Draft who did well for Canada (7 ga, 1 go, 5 pts) at the 2014 IIHF World Junior Championships last winter, got hurt early in the third frame. Pouliot made an excellent pass set up Scranton/Wilkes-Barre’s first goal from experienced Canadian legionnaire Andrew Ebbett, the 31-year-old former University of Michigan center who has skated in 200 NHL games (25 go, 65 pts) in his career. Former Eisbaeren Berlin goaltender Rob Zepp made thirty saves and did not concede an even-strength goal but it was not enough to prevent the German national team veteran from absorbing his first defeat in the American Hockey League since the now 33-year-old stood between the pipes for the Lowell Lock Monsters more than a decade ago during the 2003/04 season. 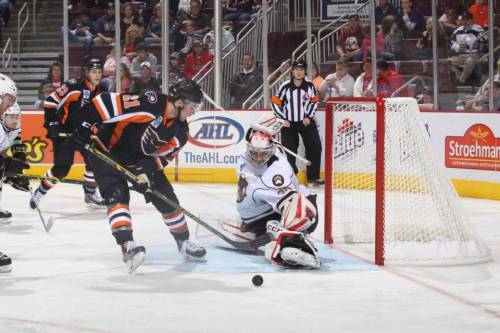 The depleted Lehigh Valley Phantoms have now scored just one goal in nearly 125 minutes of AHL play against the two Pennsylvania foes and will need to regroup quickly. 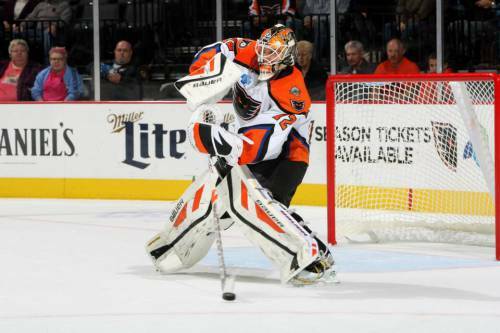 Lehigh Valley Phantoms shot-stopper Rob Zepp (72) increased his save percentage (.918) while lowering his goals-against-average (2.50) but still suffered his first AHL loss in five starts this season against the visiting Scranton/Wilkes-Barre Penguins on Wednesday night. Notes — with Gostisbehere recalled to Philadelphia and Alt on the shelf with a shoulder injury, the Phantoms defensive corps lost even more human resources when the Flyers summoned Brandon Manning to the National Hockey League. The undrafted 24-year-old from Prince George, British Columbia, spent all of last season with the Adirondack Phantoms in the American Hockey League but already has ten games of NHL experience under his belt having spent parts of his first two professional campaigns with the Philadelphia Flyers. Up from the Reading Royals of the East Coast Hockey League to beef up the Lehigh Valley back line is Maxim Lamarche, the undrafted 22-year-old from Laval, Quebec, whose spent most of his rookie season turning out in the ECHL for the Elmira Jackals (50 ga, 3 go, 8 pts, 38 pen, + 2 def rat) but did make a dozen appearances for the Adirondack Phantoms in the AHL, as well. Returning to active duty for the Phantoms against Scranton/Wilkes-Barre was left wing Petr Straka, the 22-year-old import from the Czech Republic who was the second round choice (# 55 overall) of the Columbus Blue Jackets at the 2010 NHL Draft; Straka had two goals and three points in four games for Lehigh Valley before going out injured. 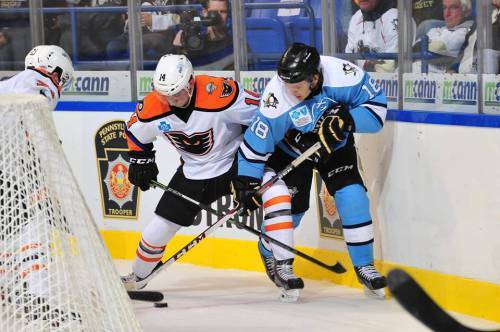 One-third of the eighteen skaters who were in uniform for the Lehigh Valley Phantoms’ first-ever official regular season AHL game on the road at the Scranton/Wikes-Barre Penguins almost three weeks were not available for the return match-up in Allentown on Wednesday night. Lehigh Valley Phantoms defenseman Shayne Gostisbehere (14), the highly touted prospect who earned a gold medal with the United States squad at the 2013 IIHF World Junior Championships while a student at Union College, battles for possession of the puck with Scranton Wilkes-Barre Penguins’ Russian left wing Anton Zlobin (18), the former Spartak Moscow youth team player who was the sixth round pick (# 173 overall) of the Pittsbugh Penguins at the 2012 National Hockey League Draft, during the 2014/15 American Hockey League season-opener at the Mohegan Sun Arena in northeastern Pennsylvania. On the heels of scoring a grand total of three goals in three pre-season games against American Hockey League competition, a surprise-packed Lehigh Valley Phantoms squad got behind its new Berlin Wall and proceeded to set off a veritable goal-scoring bomb while effectively destroying the hapless Scranton Wilkes-Barre Penguins on its official AHL regular season debut. The Phantoms actually managed to put only four shots on target in the first period but still went to intermission ahead thanks to a late power play goal from left wing Chris VandeVelde, the former NCAA champion with the University of North Dakota who has appeared in 46 National Hockey League games for the Edmonton Oilers and Philadelphia Flyers in his last four seasons skating professionally. Nearing the halfway point of this closely-checked defensive affair, right wing Brandon Alderson, the undrafted 22-year-old who scored 14 goals in 71 AHL games for the Adirondack Phantoms as a rookie last term, intercepted an errant pass from the Scranton/Wilkes-Barre defense and summarily rifled a blast past Penguins goaltender Jeff Zatkoff, the 27-year-old veteran out of the University of Miami (Ohio) who spent all of last term as the # 2 netminder for the Pittsburgh Penguins and appeared in 20 NHL games (2.61 avg, .912 svpct), to double the visitors’ advantage. A scant 81 seconds later, former University of Minnesota defenseman Mark Alt increased Lehigh Valley’s lead to 3-0 with a long range shot from the right point. 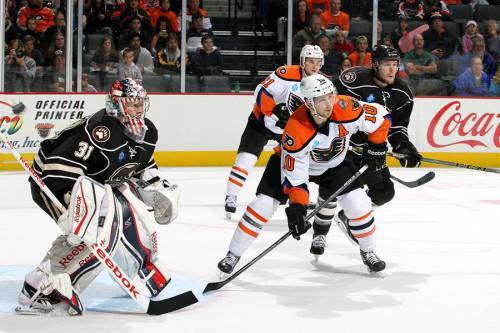 It was always going to be an uphill climb for Scranton/Wilkes-Barre after that, particularly with new Phantoms goaltender Rob Zepp, the former Eisbaeren Berlin shot-stopper who was making his first appearance in the AHL since March of 2004, playing his angles so well. Rookie Brian Rust, the former University of Notre Dame right wing who was the third round pick (# 80 overall) of the Pittsburgh Penguins at the 2010 NHL Draft, spoiled Zepp’s shutout bid by forcing home a rebound at close range with less than a second remaining in the second period to finally get Scranton Wilkes-Barre on the scoreboard. The Penguins, who are currently celebrating their 16th season of competition in the American Hockey League, had far better of the play for most of the final period, as well, but were repeatedly frustrated at all attempts to finish. Scranton/Wilkes-Barre shot themselves in the foot twice by taking late penalties in the third period and Lehigh Valley immediately paid respects to the Hockey Gods by promptly punishing their hosts on the resulting power plays. Phantoms third-line center Nick Cousins, the third round selection (# 68 overall) of the Philadelphia Flyers at the 2011 NHL Draft who totaled 11 goals and 29 points in 74 AHL games for Adirondack during his rookie pro campaign last season, put the result beyond all doubt with just less than three minutes left in regulation. VandeVelde, the 27-year-old native of Moorhead, Minnesota, who did not play in any of the Phantoms’ three preseason exhibition contests, added icing to the visitors’ cake with his second power play goal of the game with just under two minutes to skate. With a good many of the faithful already having had conspicuously made for the exits a little while earlier, unheralded Conor Sheary, the 22-year-old undrafted and undersized (5’9″ 160lbs) rookie forward from the University of Massachusetts, salvaged a measure of pride for the Penguins by scoring his first-ever AHL goal in the very last minute. 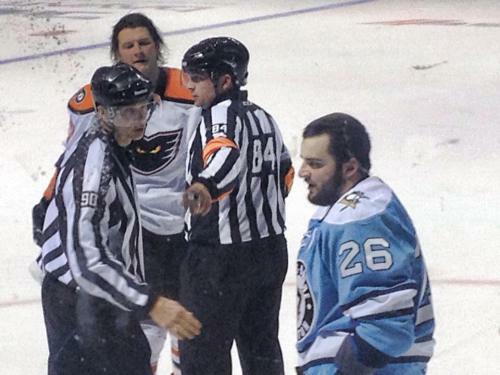 Lehigh Valley Phantoms enforcer Jay Rosehill informs Scranton/Wilkes-Barre Penguins center Dominik Uher (26), the 21-year-old who was an alternate captain for the Czech Republic at the 2012 IIHF World Junior Championships, that, despite the 29-year-old’s Canadian citizenship, he is, in fact, a one-man iron curtain who is always prepared to clamp down hard on any and all counterrevolutionary and/or subversive activity as American Hockey League officials struggle to maintain law & order at the Mohegan Sun Arena in northeastern Pennsylvania. Notes — Phantoms defenseman Robert Hagg, the 19-year-old Swedish import who earned a silver medal in each of his two appearances for his country at the annual IIHF World Junior Championships in 2013 & 2014, had a solid outing in the opener against the Scranton Wilkes-Barre Penguins. The second round choice (# 41 overall) of the Philadelphia Flyers at the 2013 NHL Draft tied for the Lehigh Valley team lead with VandeVelde by getting three shots on goal, registered a pair of assists and was one of the few Phantoms to have finished with a + 1 defensive rating, as well. 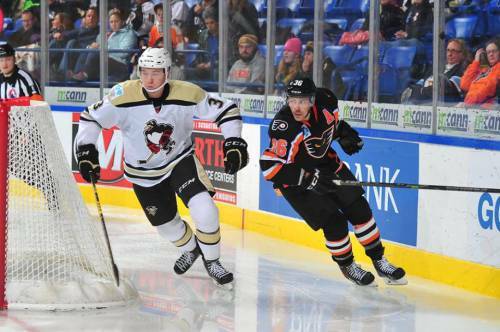 Last spring, Hagg did skate in 10 AHL games (1 go, 3 as) for the Adirondack Phantoms after spending most of the 2013/14 campaign with MoDo Ornskoldsvik in the crack Swedish elite league. 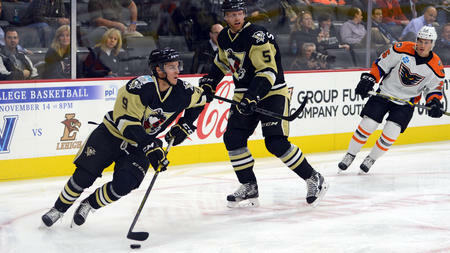 Lehigh Valley’s second line was rather ineffective against the Baby Penguins’ blueliners. Experienced center Andrew Gordon, the 28-year-old Canadian from St. Cloud State University who totaled 23 goals and 56 points in 76 AHL games for the St. John’s IceCaps last term, accounted for the only shot-on-goal that was recorded by the Phantoms’ # 2 trio. Right wing Scott Laughton, the former Canadian junior national team captain who bears the responsibility of being the Philadelphia Flyers’ first round pick (# 20 overall) at the 2012 NHL Draft, was completely held in check by the Scranton/Wilkes-Barre defense. Gostisbehere, the third round selection (# 78 overall) of the Philadelphia Flyers at the 2012 NHL Draft, had no shots on goal and was, generally speaking, all quiet on the offensive front at the Mohegan Sun Arena.